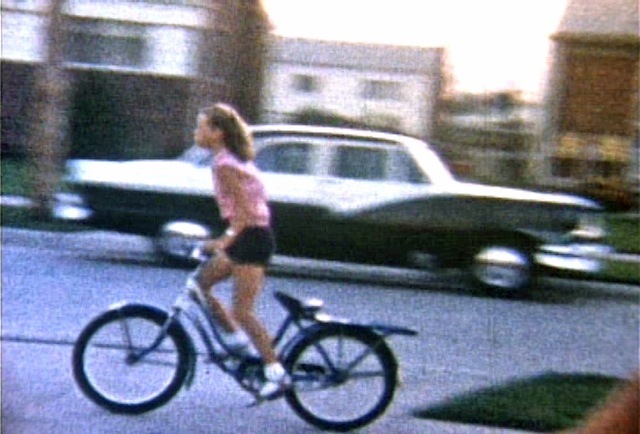 This is me, racing my bike on Wagner Street in Warren, circa 1958. I learned to walk with Old Shep at my side. Young at heart, our collie belonged to everybody who lived and played in the McCoy Bottom, even Little Man’s children who lived next door to Uncle Herm and Aunt Dean. You didn’t have to be a McCoy to live in the bottom, or up on the hill. Old Shep knew that. He licked every child for a hug around the neck. My goodness, long before Old Shep was a pup, my Grandfather Lonzo and Grandmother Laura O’Brien took up housekeeping where Little Man lived with his family. Almost everyone who dwelled along Peter Creek before, during, and after World War II settled for a spell into one of the five log cabins Great-grandpa Lark built. Great-grandpa had logged the mountains and used Peter Creek when running high for transporting timber downstream to the Tug River, the boundary between Kentucky and West Virginia. Of nomadic nature, the O’Brien family lived in the McCoy Bottom before the War long enough for Mom to catch Dad’s eye. When my father returned home from the War in his Marine uniform, Mom and Old Shep welcomed him. When Mom and Dad moved us to Michigan, Old Shep remained at the homeplace where he belonged. He slept in the barn in winter and under the stars in summer. He never stepped a paw inside the homeplace. A farm dog knew his habitation and gladly abided within it. He hunted his own food and drank from the creek. A smart dog, Old Shep knew to stay off the road to live a long life. I never knew another childhood guardian and companion like Old Shep. When we lived in Michigan on Wagner Street, Ginger was our family pet, another darling cocker spaniel Uncle Jess bred. Unlike Old Shep, Ginger had no barn for shelter, and Dad’s garage was off limits to her. She slept in the house with us, sometimes curled up on the foot of a bed. Mom fed Ginger dog food and kept a water bowl on the landing to the basement. Some neighbor mothers feared dog bites and rabies, so Ginger didn’t have freedom to run our neighborhood. Unlike Old Shep, she didn’t belong to Wagner Street. She belonged to the O’Briens at 25708. As children, we did our best to care for Ginger’s health and happiness. We played with her and brought her back to our yard when she strayed to another. We didn’t want our puppy to run away like Buttons did the winter we lived on Yacama Street in Detroit. Thankfully, Ginger was smart like Old Shep and knew not to cross the street without us. Ginger also wagged her way into our games on the front and back lawn. She jumped on us when we played leapfrog. She ran in circles when Dad brought out his kite reel and kite. Then she chased the runner who launched the kite. And how she barked and chased the wheels on our bikes! My favorite place with Ginger was the woods across from Frazho Road where I discovered rhubarb. We both belonged to the trees and swamp, like Old Shep and the McCoy Bottom and Peter Creek. As the ninth summer of my life came to a close on Wagner Street, one day Ginger no longer wagged her tail and chased us on our bikes. I never dreamed our cuddly dog could get sick. Mom didn’t seem too alarmed until Ginger’s tongue hung from her mouth and she walked into walls. I felt sorry for our pet when Mom carried her to the garage. A shiver went through me when Mom closed the door. Ginger could suffocate in the heat. 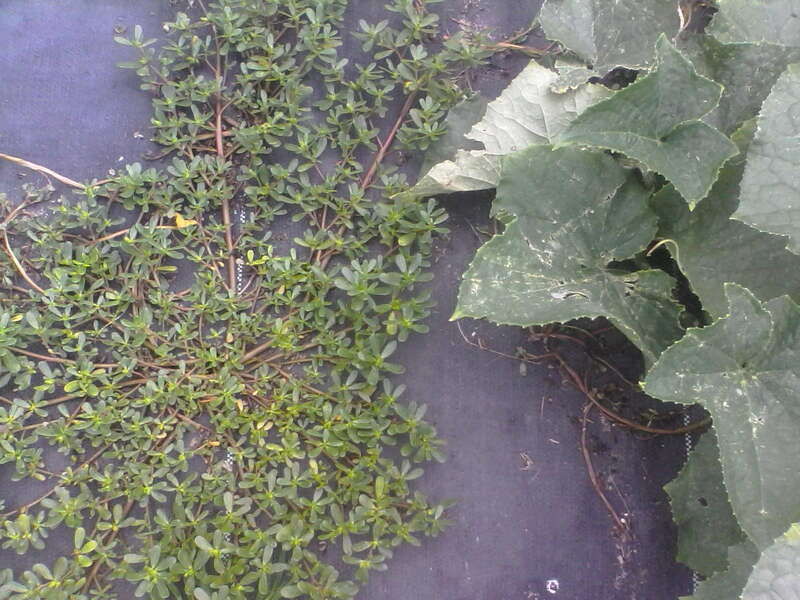 I was too short to see Ginger through the narrow garage door windows, so I climbed on a chair and peeked through the window above the flower box. I could barely see our sweet dog in the darkness. It broke my heart. She couldn’t stand on her four paws. She staggered as if she was blind. The thought never crossed my mind that Ginger might die. Then a man came to our house. “Everybody go home, please,” he said. He looked through a garage window. Then he slipped on a one-piece suit, mask, and a pair of gloves that went up to his elbows. “Mrs. O’Brien, please take your children inside the house,” he said. I dashed downstairs alone and paced the width of our unfinished basement back and forth. My heart and head throbbed with the force of love and loss for Ginger. The man’s boots passed by the basement window. I knew he took Ginger with him. I knew I would never see her again. I sobbed as never before because there was nothing I could do to save Ginger. I’d realized too late how much love and joy our red-haired puppy had given my family and me. Ginger’s death left an inconsolable hole in my heart that only Old Shep could fill when we returned to the McCoy Bottom in summertime. My mother must have suffered similar grief, for she never accepted another puppy of any breed from Uncle Jess. She took in tomcats instead. More practical, they didn’t possess puppy-dog eyes that stole your heart before you knew what was happening. Little did we know another cocker spaniel waited seven years in our future. I followed Mel and his shovel down the hill to the hen house. 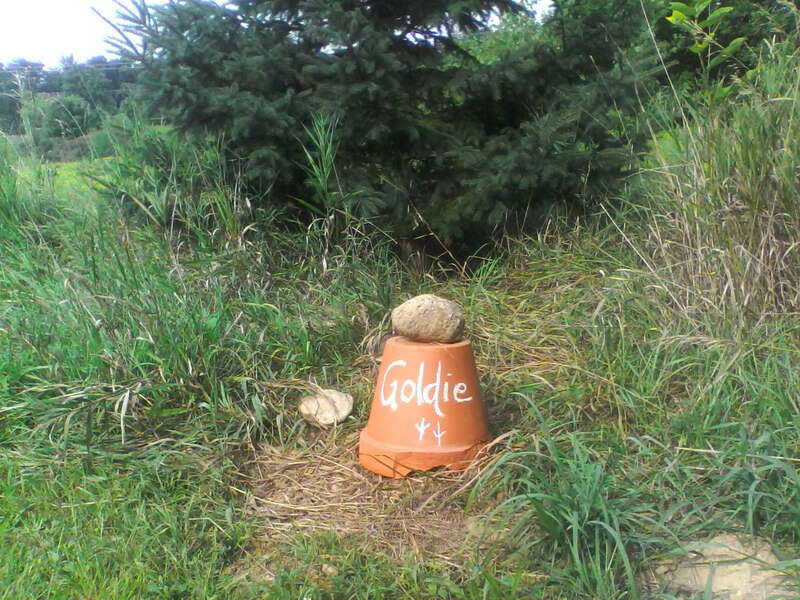 Our footsteps left tracks in the sparkling dew—a beautiful morning for Goldie’s burial. Now we’re down from five girls to two. Several weeks ago, Mel found Blondie, our diva, and Blackie, our wise one, mutilated on the chicken side of their house. The following day, I spied a family of mink along our road not half a mile west of us. Mel repaired the hole where the vandals broke into their pen, but we know his fix with zip ties and leftover metal shelving is not sufficient for the mink’s cunning instinct. We’ve searched without success for a metal fence equal to our bloodthirsty enemy. Meanwhile, we close the house’s chute before dusk and lift it after sunrise. Goldie limped after the mink’s attack and didn’t range too far with Silver and Brownie, her fellow survivors. We fed our injured hen garden scraps and tomato worms. We assisted her into the house before dusk. The high-strung sister, Goldie lay in peace behind the galvanized grain can in the hen house. Several of our hens have entered their final rest in that hallowed corner. No matter how you prepare to let a loved one go, the severing of death is a stark and harsh reality. Our sweet girl we cared for rain or shine no longer stood on her feet and talked to us. “Goldie, you put up a good fight,” Mel said. In peace and privacy, Mel dug Goldie’s grave in our hen cemetery behind my vintage camper. I turned a terracotta pot upside down and placed a rock on top for a monument. We thanked our hen for her delicious eggs with orange yokes. “Well, another burial behind us,” I said. In that quiet place, we recalled the string of extraordinary people and circumstances that led to the second burial of our firstborn and my father. Unawares, an old friend planted the idea in my mind. She’s the kind who inspires naturally. The possibility of moving our departed from the cemetery hemmed by I75 to a country graveyard nearby grew from passion to fact. “There are plenty plots available,” the township clerk said. The certificates for our lots arrived in the mail within three days of purchase. The cost was fraction of the mammoth commercial business where we buried our daughter twenty-two years ago under the shock of grief. Kevin Lynch of Lynch & Sons Funeral Home in Oxford assisted me with legal matters, which were several. For instance, a funeral director must witness disinterment of a vault and verify the name on the cover. My husband and I joined Kevin and also confirmed the names. Dear Reader, on a breezy June day last year we buried my father and our eldest daughter again. Today, customized monuments stand in testimony of their place on this earth and in our hearts. We visit their graves in peace and privacy—comfort one another in their beautiful burial. I resemble my mother most on a bright summer Saturday morning. We’re the nearest we’ll ever be on this planet when I transfer clean bed sheets from the washing machine to my laundry basket. She bestows a smile upon me when I slide open the basement door and walk to the clothesline. I recall our patch of backyard in Warren, Mom snapping out the linen’s wet wrinkles and nodding to me for a clothespin. With three sisters, I was happy to have some time alone with my mother. A typical housewife of her generation, she never played outside with us. Even then, I had a sinking feeling I could never hang sheets exactly like Mom. Her billowing clothesline was a work of art when she finished. The “big” laundry including tablecloths began at the pole. Pillowcases and shorter pieces followed. To economize clothespins and line, our pajamas and underwear shared a pin with its neighbor. It remains a puzzle. Mom was 100% pure Southern, a real McCoy on her daddy’s side. They’re supposed “to move slow as molasses in January.” Not my mother. Not her mother of German heritage. When it came to housework, gardening, and putting up food, they both moved at high speed and productivity. I did not inherit that gene. With all the modern kitchen gadgets, I could not and cannot produce the quantity of canned fruits and vegetables in one season that Mom and Granny did. Speaking of food, after I hung the sheets, my mother followed me to our stringed bean fence. In her golden years, she’d sit and snap lapsful of Uncle Herm’s white-half runners or Uncle Tab’s greasy beans. But she couldn’t countenance Uncle Jim’s Turkey Craws without a frown. “Jim lets his beans get too full,” Mom would mumble. I prefer the flavor of a full kernel—a small point of agreement that serves our supper table of two with peace and gastronomic pleasure come bean season. When we at last carry a mess of green beans into the kitchen, the pot calls for the southern treatment seasoned with onion, a few small new potatoes, and bacon grease. “And her favorite Silver Queen sweet corn,” I add. Dear Reader, I have a feeling Mom wouldn’t approve of the local corn we bring home to complete our garden feast. We’ve had to tweak what we grow in our golden years. Mind, Mom never had to contend with deer. Not in Appalachia. But she once came upon a copperhead in her strawberry patch. I’m the furthest I’ll ever be on this planet from a copperhead in a strawberry patch.